Sartorial doesn't reveal the cut of its jib at first. It's got a freshy-fresh, generic launch. The magic happens when it revs up on the skin -- it goes from being anonymously crispy to worn-in, lived-in, faded to perfection: musky honey and leather, beaten-up woods, vanilla and amber and myrrh. It has a real presence. It's thick, but not leaden or syrupy. My girlfriend, the artist Georgie Hopton, has started an instant cult (well, a cult among her friends, anyway) with her adoption of Penhaligon's Sartorial as her new signature. The stuff is absolutely intoxicating on her! When I'm visiting her, I've been known to sneak into her bedroom to squirt some on myself. It glows really softly, warmly and persistently around the wearer. It's broken-in and deep and nuzzleable, and I never would have given it the time of day in a Penhaligon's store. Smelling it there, all I got was lime and black pepper freshness. I even demanded that Georgie show me her bottle -- I was sure she was telling me the name of the wrong perfume. But soon enough, Sartorial warms up into a comforting, beeswaxy, myrrhy musk. And get this: it's startlingly and absolutely a "grandpa smell", but that's part of the beautiful contrast when worn by my vibrant and feminine friend. I wonder if Sartorial would lose its magic if worn by a man? I like how it smells like the inside of a closed room filled with nice people. 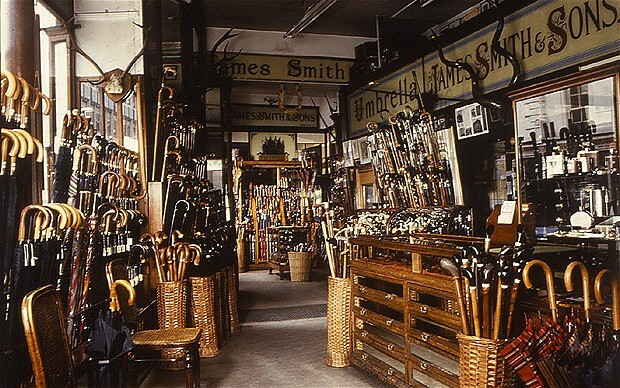 I've not stacked it up against the actual smell of Norton and Sons, but I can vouch for its resemblance to the smell inside James Smith and Sons umbrella shop. 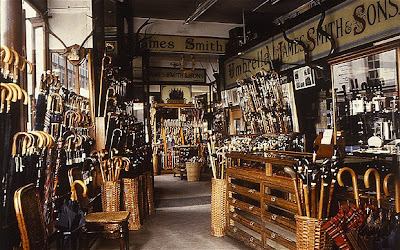 This London institution dates from 1830, and in addition to umbrellas sells "town canes, country canes, dagger canes and sword sticks". Marvelous. A dagger cane may be Dickens-style gangsta, but it won't help you in the rain. The close air of this pleasantly musty shop smells of leather, wood, polish, and classic men's fougère cologne. A little DIY Sartorial. I'm wearing Sartorial. Though my nose tells me I'm wearing Brut. Sartorial isn't quite Brut, but not having owned a bottle of Brut since I was sixteen, I can't pinpoint all the differences. I'm almost certain it's stronger, and there's that modern ozone thing, which is especially noticeable because the Brut/fougère part of the fragrance is so familiar that the ozone part stands out like a sore thumb. Or a sore thunderstorm. My first impression is it smells good, but only because it's a classic fougère and classic fougères smell good. I'm still trying to figure out exactly why I like/hate this. I once caught hell for dogging Sartorial in a review--actual anonymous 'you're a bad person' emails. I didn't particularly like the fragrance, though I'm a great fan of Duchaufour. You're bound not to adore every single fragrance even from a fav perfumer. But Sartorial was the worst example of marketing taking precedence over fragrance in the niche world. Penhaligons went so for into the bespoke fetishism that the fragrance was irrelevant. I think I'm with Dan on this one. Scolding kooks manage to ooze their way into every seemingly inoffensive niche interest. I wonder what kind of threats and tiffs exist in the knitting community? Re Sartorial, I was spared the marketing and came to it unprejudiced, since the first I knew of it was when I smelled it on my friend. Hmmm Duchaufour fumes always have so many varied notes and are always a bit interesting, but I never feel that the sum of the parts is greater than the parts themselves (with maybe 1 exception). This sounds like another one of those. I will try but not expect to love. After having read your description of Sartorial, the Perfume Lover, and also blurb on other of his scents, I kind of think that his approach limits him, and fails to produce anything that truly wows. And god I hate the advertising thingy, with its Duchaufour's nose worship, so much. Well, Duchaufour does churn out the work, so there's bound to be some water-treading in his oeuvre. Cutesy, yes, but a bit of fun quirk doesn't go amiss in an industry that is usually pretty humorless and cliched. The ad featuring the perfumer could have been worse. It could have featured Duchaufour in a partially unbuttoned shirt, riding in a limo with a bored model. Or shirtless, holding a bottle of Sartorial and gazing seductively past the camera. That said, I haven't tried Sartorial, but I will, next time I have the chance. You're right, it came out a few years ago, at the start of that whole "Rock Star Perfumer" lunacy, and BD was certainly the poster boy for that. So now you have me feeling grateful for the quirky Gilliam cartoon! The perfume itself seems to get mostly good reviews; my grumpy opinion above seems to be in the minority. I wonder if it sells well? Ha-ha, Melissa! Maybe it's for the best that the skin featured in this clip was Duchaufour's nose. I would be much, much more likely to try Sartorial based on your great review than from watching the Penhaligon's video. Though it does sound like Sartorial is a bit of a "throw back" in time, which the video also manages to convey. Thanks Randy. I suppose where you're being thrown back to depends on who's wearing it. I'm with Dan on this one. Sartorial is interesting and one can admire the idea of marrying a traditional masculine with modern synth notes. But I simply don't like many of the synth notes. Penhaligon seems to be shaking up and producing a touch more innovative and experimental stuff, a welcome change from its old and frankly unimpressive lineup. I don't think they've yet produced anything I love, but at least they're moving in a good direction. The new ads are fun (and possibly better than the perfumes). Katie, please review Allure Sensuelle EDT and EDP- and how would you find it on a man ( I still adore it). If I layer EDT+EDP, I get almost the effect found in the extrait ( which I love and find it closer to the EDT- the EDT perfected- the EDP is rather incomplete- but it's still nice). I get in the summer a sexier Daim Blond, some patchouli from Coromandel ( but not as much vanilla and dirt) and a Black Orchid way in the background in the EDP. Also some nag champa/frangipani scent worth checking? I've yet to explore Allure Sensualle - sounds like you've analyzed it down the the last molecule. For a nag champa perfume, aside from a cheap'n'cheerful hippie oil or the nag champa oil from Memoire Liquide, I get a nag champa hit from Intrigant Patchouli by Parfumerie General. For frangipani, there's Annick Goutal Songes. Going off the strictly frangipani track, my fave tropicals at the moment are Les Nez Manoumalia and Miller Harris La Pluie. Yes but is it elegant Katie? Sartorial isn't elegant. It's robust and rough around the edges. Yes, Sartorial is a grower. First impressions deceive. Yes, yes, and indeed, YES. So glad!